You are most welcome to celebrate the Baccalaureate Mass for your school at the Cathedral Basilica. If you have already submitted the "Baccalaureate Mass Reservation Form," please complete the form below which asks for all liturgical details, at least two weeks in advance of the scheduled practice for the Baccalaureate Mass. 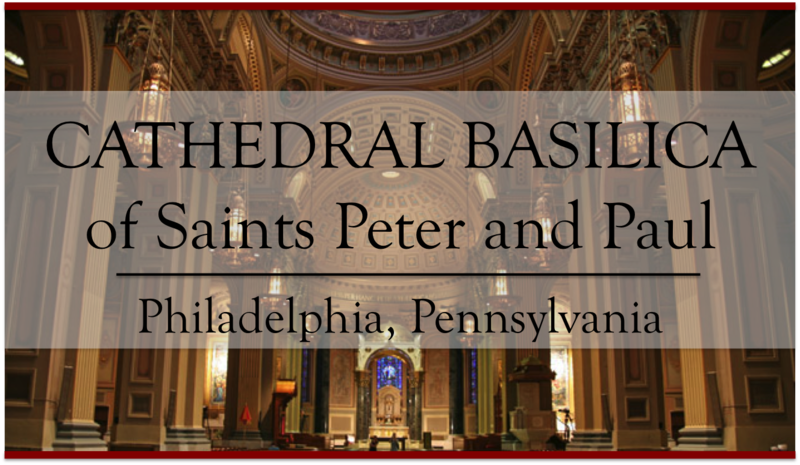 If you have any questions, please contact Father Dennis Gill at fr.dgill@archphila.org or 215-561-1313 or 215-587-3537. If you have Graduation following the Baccalaureate Mass, please contact Father Dennis Gill as soon as possible to review the plan for this part of the celebration. If more than 950 people are expected to attend the Baccalaureate Mass, then extra seats will be needed. The Cathedral Basilica has 250 additional seats on hand. If more than this is needed, then the Cathedral Sacristy can rent them and a charge will be incurred. No tape of any kind or wires may be used on the pews. Large rubber bands or ribbons can be used to attach signs to the pews. When additional seats are needed for the celebration of Mass, then monitors are available for the side aisles of the nave. Please contact Dan Kearns, kearnsmediaconsulting@gmail.com , to make arrangements directly with him for the use of the monitors. Adult moderators are to be assigned for order, safety and security. Directions are to be given for silence in the Cathedral Basilica before and after the celebration of Mass to encourage prayer and adoration of the Most Blessed Sacrament. Food, drink, balloons and noisemakers are not permitted inside the Cathedral Basilica. Your assistance with cleaning up the Cathedral Basilica after the Mass is also appreciated. The male graduates are not to wear their caps for the celebration of Holy Mass. Only the clergy, the servers and the cantor are to have seats in the sanctuary. No one else is to take a place in the sanctuary, including the administration and faculty of the school. Lectors and Communion Ministers do not sit in the sanctuary but in the nave. The Cathedral Sacristy provides vestments for the Bishop/priest celebrant. Celebrants are asked to provide their own albs and cinctures. When the Archbishop celebrates the Mass, he presides from his Cathedra. When another Bishop or priest celebrates Mass, the chair for the Bishop/priest celebrant is placed in the sanctuary on the cathedra side. Only a deacon is placed next to this chair. Concelebrants sit in the choir stalls. If a Bishop presides in choir, then a chair and kneeler will be set up in the sanctuary with a stole for his reception of Holy Communion. All concelebrants are to wear a chasuble and stole, preferably the archdiocesan vestment. The Cathedral Sacristy can provide additional chasubles and stoles, if needed. All concelebrants are to provide their own albs and cinctures. Concelebrants vest in the Neumann Room. Concelebrants sit in the choir stalls on either side of the sanctuary. Dalmatics are provided for deacons by the Cathedral Sacristy. Deacons are asked to provide their own albs and cinctures. Deacon chaplains sit on either side of the Archbishop/Bishop. The deacon of the Mass sits separate from the chaplains. If there are no chaplains, he sits to the right of the celebrant. The Book of the Gospels is only carried by the deacon when the actual Gospel is in the Book of the Gospels. Otherwise, the deacon proclaims the Gospel from the Lectionary. The Universal Prayer is read from the stand in the sanctuary. The deacon is asked to insure that all the Sacred Vessels are properly purified during or after Mass. The liturgical music plan is to be approved by Father Dennis Gill and the Cathedral Director of Liturgical Music, Ms. Charlene Angelini, 215-587-3537 or cangelini@archphila.org. Once a copy of this form is received, it will be reviewed for approval. Please do not print any worship aids or booklets until you have received an approval response. Please contact the Cathedral Director of Music now to discuss arrangements and plans for liturgical music. The ushers and greeters, the altar servers and the lectors are to be provided by the High School. It is expected that all of these liturgical ministers are familiar with their roles and will be well practiced for the Mass at the Cathedral Basilica. Those who carry out liturgical ministries are to be Roman Catholics. A student may participate as a liturgical music minister, in the role of cantor, if he/she have served as a cantor on a regular basis at parish or school Masses. A Cathedral Cantor is also available for the Baccalaureate Mass. The High School is responsible for the stipend of $125 for the Cathedral Cantor, to be paid no later than the day of the Mass. A Cathedral Organist must be used for the Baccalaureate Mass. The High School is responsible for the stipend of $175 for the Cathedral Organist, to be paid no later than the day of the Mass. If the Cathedral Organist is needed for the rehearsal, not to exceed two hours, for the Mass then there is an additional stipend of $125. It is preferred that the altar servers are not among the gradautes. Altar servers are expected to provide and wear albs and cinctures. Cassocks and surplices are available in the Cathedral Sacristy if all the servers are male and this is the custom of the school. Typically, four servers are expected: thurifer, crucifer, two candle bearers (who serve the Mass). If a Bishop is the celebrant, see the notes for altar servers on the website of the Office for Divine Worship. The cantor leads the liturgical music from the stand in the sanctuary. A seat and kneeler is provided by the stand. It is preferred that the cantor wear a cantor’s robe which can be provided. The psalm, preferably sung by a psalmist, is sung from the ambo. All the readings for the Mass are proclaimed from the ambo. The Responsorial Psalm is sung from the ambo, preferably by someone other than the cantor. The lectors and the psalmist, if other than the cantor, sit in the nave and enter the sanctuary only to proclaim their assigned reading and sing the psalm. Only bread and wine may be brought forward in the procession of gifts. The table for the gifts is at the break in the pews in the nave. In the absence of ordinary ministers of Holy Communion, properly commissioned extraordinary ministers of Holy Communion assist. Typically, there are four to six Communion ministers: two at the entrance to the sanctuary, two at the break in the nave, and, if needed, one at each side section of the nave. Holy Communion is distributed under one kind at the Baccalaureate Masses. Obligatory observances cannot be set aside in favor of the Baccalaureate Mass. When there is no obligatory observance, then the another commemoration is possible. For liturgical music, please include the title and composer. Who will recite/sing the Penitential Act? Gloria - if sung, what is the setting? Please submit a copy of the Universal Prayer with this form. The Sanctus, the Mystery of Faith and the Amen are sung. The proper liturgical books will be provided for Mass, the Roman Missal and the Lectionary for Mass, and these are to be used for the celebration. The lectors are to proclaim the Word of God from the Lectionary for Mass and not from sheets of paper. Binders are available for copies of the Universal Prayer. If worship aides are to be printed, please include all proper copyright information. Copyright information is required for all liturgical texts and music. Also, the guidelines for the reception of Holy Communion published by the United States Conference of Catholic Bishops are to be included in the worship aid. If flags or banners are to be carried prior to the entrance procession of the Mass, please insure that stands are provided for them outside the sanctuary and in a position not to interfere with the sight lines of the sanctuary. Will flags or banners be used? Arrangements of flowers are permitted for the sanctuary but not immediately in front of the altar. This is a separate request and needs to be confirmed when you confirm your date and time for the Baccalaureate Mass. A donation $250 is appreciated for the for the use of these facilities. You are kindly requested to indicated below if any of these facilities will be used as well. Will the Cathedral Chapel be needed? Will the Drexel Hall (formerly known as Chapel Hall) be needed? Will the Neumann Room be needed? Other Needs - Please specify any other needs or concerns below for the Baccalaureate Mass, especially for persons with disabilities. Access for persons with disabilities is on both the Race Street and the Archdiocesan Parking Lot entrances. On the occasion of the Baccalaureate Mass, a Cathedral sacristan will assist with the preparations for Mass and remain until all is concluded following the Mass. Additionally, one of the parish priests will assist with the celebration. The priests and staff of the Cathedral Basilica are happy to host your High School on the occasion of the Baccalaureate Mass.